Bank of Maharashtra Recruitment Notification 2017 Apply Online for 100 Chartered Accountant Posts: Bank of Maharashtra, One of the Leading Listed Public Sector Banks has advertised a notification for recruitment to the post of Chartered Accountant. 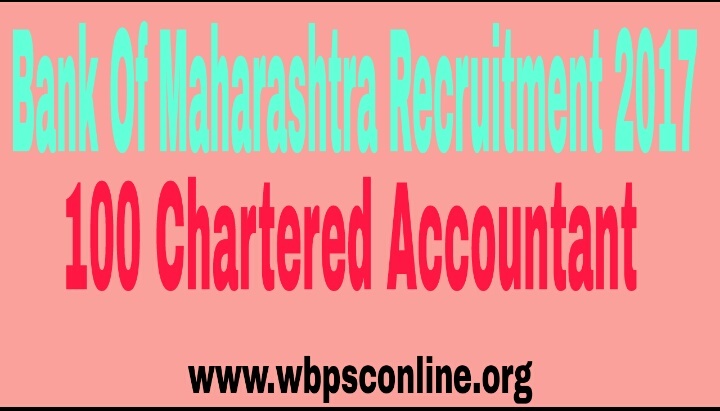 Online applications are invited from the eligible candidates for CA Jobs in Bank of Maharashtra through only the official website(See Url Below). Educational Qualification: The applicants should have Graduate degree from a recognized University with Professional Qualification of CA from a recognized Institute/ Board for the said post. Also the candidates should have one year post qualification experience in the relevant field to apply for the above mentioned post. Vacancy: Total no. of vacancies are 100 (UR=51, OBC=27, SC=15, ST=07). Age Limit: The applicants must have age between 21-35 years as on 01.09.2017. Application Fees: The applicants are required to pay application fee of Rs 600/- ( For SC/ ST/ PWD Candidates Rs 100/-) through online mode only and no other mode of payment will be accepted. Selection Process: The candidates will be selected on the basis of Short-listing, Group Discussion and Personal Interview. 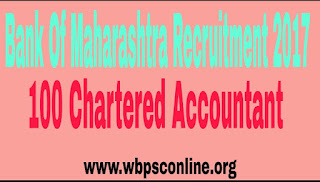 Interested and eligible candidates may apply online for Chartered Accountant post in Bank of Maharashtra through the Bank’s website only at www.bankofmaharashtra.in. To get more detailed information about online application process download the Full Advertisement. Last date of Online Application is 7th October, 2017 and the last date for receipt of hard copy of online application with enclosures is 17th October, 2017.